Impress your friends with this perfectly packed Quiche. 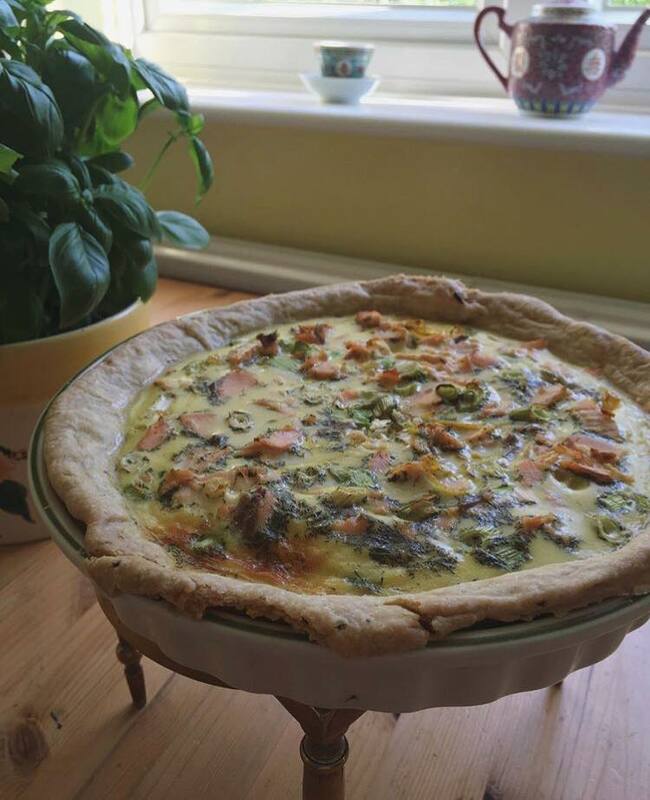 Filled with succulent salmon and fresh vegetables, you will find this a perfect party pleaser, family favourite, and a real summer staple as it keeps for up to a week in the fridge ready for light lunches and dinners. For you veggies out there, I have you covered with some alternative switches, so you need not miss out on this tasty dish! It does require some time to make, but I find it really therapeutic and fun to make. Stick a podcast on, and get developing some useful culinary skills as I walk you through making this tasty meal. VEGETARIAN? I got ya covered! For those vegetarians out there, simply take out the salmon, add in more vegetables of choice to the filling, and I recommend adding slices of goats cheese and sun dried tomatoes on top before baking. If not using pre-cooked salmon or smoked salmon then jump to step 2. 1) Place the salmon fillets on baking paper on a tray, squeeze over the fresh lemon juice and sprinkle with dill. Wrap the baking paper around them so they are covered. This keeps them moist and they will cook in tasty juices. Cook on medium heat for 15 minutes until partially cooked, and tender, then flake the meat into a dish making sure the skin and any bones are removed. 2) To make the pastry, tip the flour, salt, seasoning into a bowl. 3) Add in the butter/oil and rub together with your fingertips until the mixture resembles breadcrumbs. 4) Add 6 tbsp cold water and work into the mixture with your hands to form a soft dough. You do not want it to be too sticky so add the water in gradually as different brands of flours will absorb water easier than others. Bring everything together with your hands until just combined. At this point the pastry can be chilled for up to 2 days or frozen for up to a month. 5) On a lightly floured surface roll the pastry out to around 5cm larger than your pastry case, and to around the thickness of a 1pound coin. 6) Use your rolling pin to lift it up drape over the tart case so there is an overhang of pastry on the sides. Using a small ball of pastry scraps, push the pastry into the corners of the tin. 7) Cook the peas in boiling water for 3mins, then drain and rinse under cold water. 9) Lightly prick the base of the tart with a fork, and cut a circle of grease proof paper to fit on top of the base of the pastry. You can then pour baking beans on top which will prevent the base from puffing when cooking. Blind-bake (without the filling) for 20mins, then remove the paper and beans and continue to cook for 5-10mins until biscuit brown. 10) In a saucepan, sauté the onions lightly in olive oil with salt and pepper. When softened add in the courgette slices and diced leeks, cook for around 3minutes until softened and take off the heat to cool. 11) In a large bowl beat the eggs, gradually add the cream and season with pepper. I also like to add in oregano or finely chopped fresh basil. 12) When the case is ready, spread the pea purée over the base, then layer your veggies on with the flaked salmon, spring onions and egg mixture. Add a few shavings of Parmesan to the top. If you are vegetarian simply replace the salmon and parmesan with sun-dried tomatoes and sliced goats cheese. Bake for a further 20-25mins until set and golden brown. 13) Leave to cool in the case, trim the edges of the pastry, remove and serve in slices with a fresh green salad, and glass of sweet white wine.